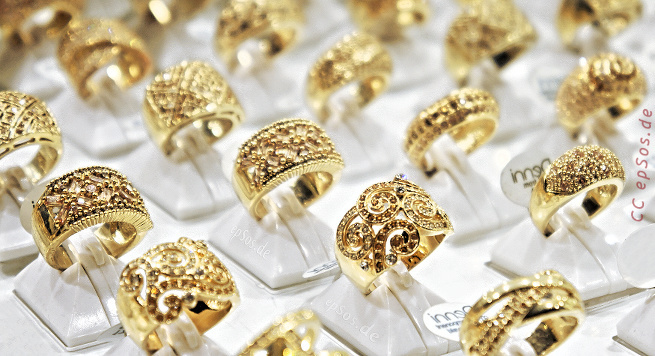 Beautiful golden rings in the gold jewelry shop. The successful history of gold began thousands of years ago. This soft and yellow metal is very easy to use with other metals. It has a good melting temperature and can not rust, but will change color, if it is dirty. Rich men say that gold is valuable. Rich men say that golden resources are rare. The wise women can use their own head to understand the real price and the realistic value of gold. 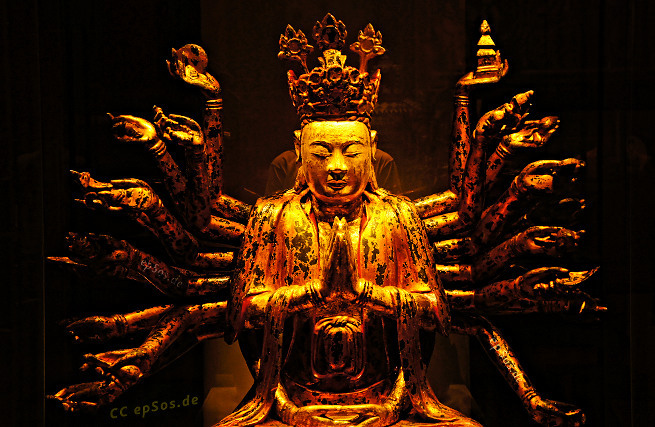 Golden Buddha statue with many hands. The market price of gold is not decided by the people who buy gold. The market price of gold is decided by the people who own the golden resources and the banks. The total amount and the value of gold is not known, because the greedy men and organizations that own the gold mines are very interested into keeping the real value of gold under the big shadow of their profits. Golden people have an expensive price. It is more profitable for the owners of the golden resources to pretend that gold is rare and limited, because it will make their own gold mines more valuable, if the simple people believe that the golden metal is limited and expensive. The wrong information will make the miners of gold much richer, if the people believe that gold is more valuable than other forms of investment. A beautiful lie is more profitable than the truth about this yellow metal. The total amount of gold is not known to the buyers, because it is more profitable to spread wrong information about the real amount of resources that rich men wish to sell to the public customers. Picture of the gold necklace for golden investments. Gold is a popular metal. It is a metal. Just a metal. Not more and not less. Many simple men loose their mind in the magic of this golden metal. Golden objects are often used for trade, for religious rituals or as a golden jewelry for the traditional Indian weddings. This yellow metal is also used as money or as an investment. Greedy men without knowledge often think that the expensive gold is a safe investment against inflation. It is wrong. Very wrong. The international price of gold is measured in US Dollars. The international price of gold can remain stable for many weeks, but the price of the US Dollars can become lower against other currencies. Therefore the real price of gold can become lower than other currencies and investment assets. 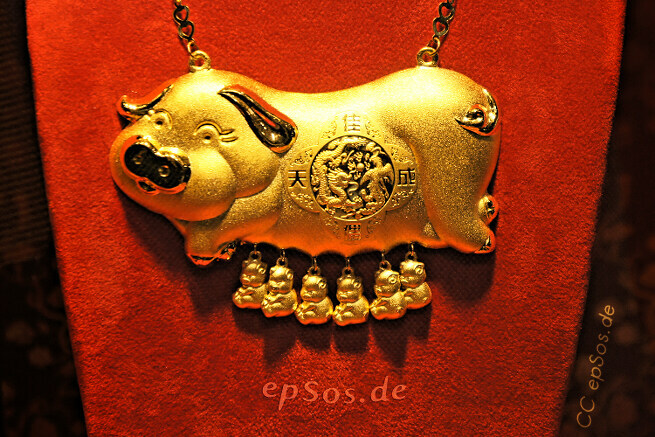 Golden pig from the Chinese jewelry shop. Every year, there is more and more gold that is found in the very near universe. Greedy men still think that this golden metal is scarce and valuable. Every year, the price of the US Dollars is becoming lower than valuable goods, services and luxury products in other countries. This process is called inflation. Many people think that gold is safe against inflation, but it is very wrong. 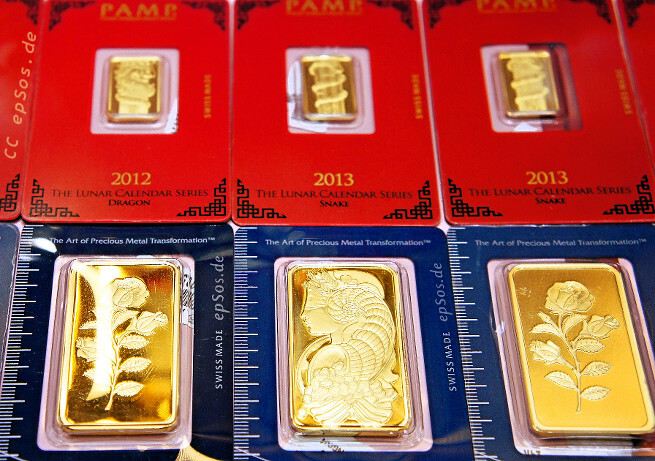 The price of gold can remain stable, even if the price of the US Dollar can become lower. Therefore the real price of gold is becoming lower and lower every year, because the price of gold is measured in US Dollars and not in other valuable currencies, goods or services. Golden necklace from the gold chain jewelry shop. 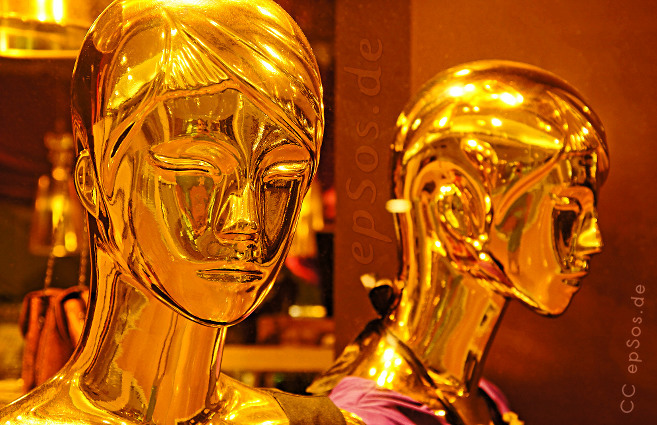 The real price of gold is artificial. The international value of this golden metal is wrong, manipulated and very far away from reality. 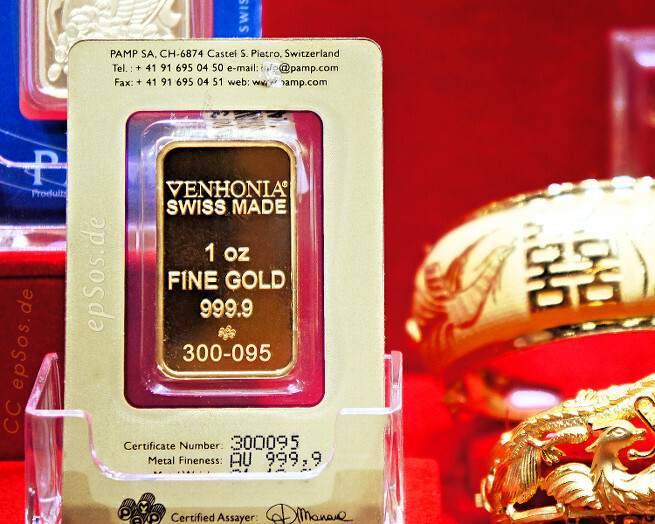 The artificial price is very profitable for the people who sell gold to the public customers. Be wise. Gold is a complicated investment. The real value of gold is negative during the stable economic periods with a small inflation. The same golden value is very positive during the major crisis or during the big inflation. In other words, gold is not a good investment during the stable and peaceful years. It is good during the war. It is good during the very long economic depression or during major destruction of civilizations, but it is very wrong during stable and peaceful time, because the price of gold is very artificial, when the society is under the stable control of the rich people who manipulate the price of their golden resources. Expensive gold bar from the jewelry shop. In 2012, approximately 40% of all gold resources were produced in Africa, the USA, Australia and Russia. Russia is huge. It is bigger than all other countries. It has the most resources, but it never publishes any real numbers, because it is more profitable to keep the real numbers in secret. It is very wrong. It is very impossible that the biggest country has less golden resources then a 10 times smaller country from Africa. It is a lie that becomes visible to the wise women who can look at the map of epSos.de with open eyes. Golden bars in the bullion shop. Currently, more gold is produced in two years than in the one thousand years of the Middle Ages. The environment is destroyed during the golden mining process. The rivers are polluted with chemicals and the trees are removed from the mountains. Every year, there is more gold than the history has ever known. The simple people continue to think that gold is scarce and limited. Golden bracelets from the luxury gold shop. The average amount of gold in the sea water is 0.004 mg per ton of sea water. Rich men use free electricity from solar panels and wind turbines for the extraction of this salty gold. The total amount of gold in the ocean water is 40 times larger than all other golden resources on earth. The volcanoes in the ocean have 100 times more gold than the golden mines under the surface of the earth. The golden asteroids have more than 1000 times more gold than earth. It would cost less then 100 billion to get this gold from the asteroids, but the owners of the golden resources on earth are against this freedom. Cheap gold is against the interest of the rich men who own the golden resources. 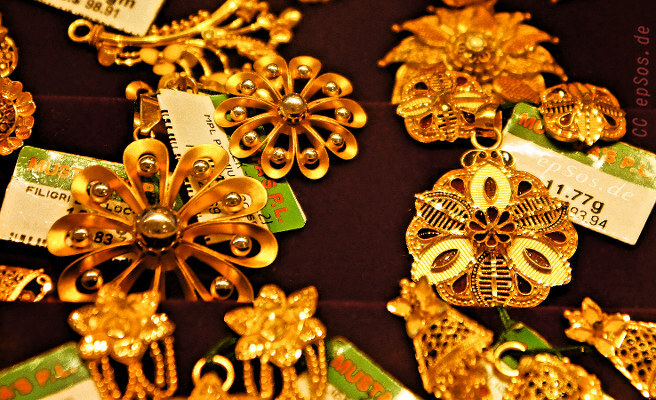 Beautiful gold jewelry designs from the Indian shop. Therefore, the price and the total value of gold is artificial. The rich men keep destroying the green environment on earth, instead of taking the cheap gold from the salty ocean water and the asteroids. Golden jewelry is made from cheap gold that is mixed with other metals. It is more profitable for the rich men to sell cheap golden jewelry at a high price. 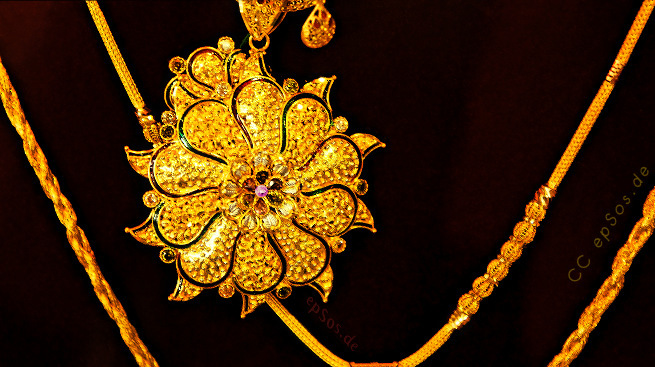 The Indian culture requires people to buy gold for weddings. 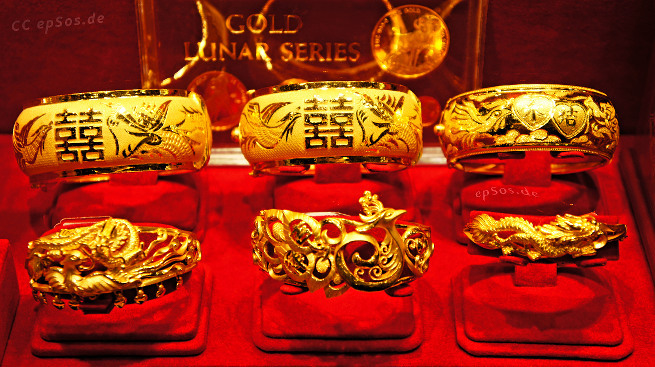 The western culture requires the people to buy golden rings and watches. The rich men need simple people who want to buy expensive jewelry that was cheap to produce. The greedy men need religion and culture that creates value in the golden jewelry and golden objects. The real price and value of such objects is in the heads and the imaginations of the simple people. There are substitutes for gold that look exactly like the real golden metal. Those substitutes contain mixed copper that often has no real gold inside. In some cases, gold is added as a thin layer on the top of the expensive jewelry. 1% of this golden jewelry is real. The other 99% are not valuable. Wise investors criticize the investment into gold, because gold generates no income and therefore it is very negative during the economically stable times. Female investors often buy gold directly from the miners. Then the raw gold is melted into coins and small bricks with numbers. Then the pure and clean gold bricks are sold at a higher price to the public investors and collectors. 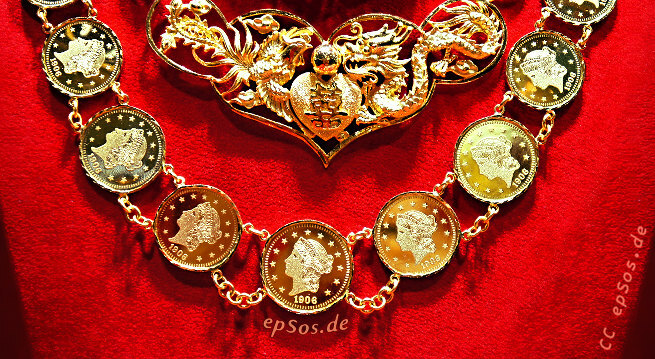 The golden jewelry and the gold coins generally contain a very substantial premium over their actual value and therefore usually are not suitable for investors who wish to speculate. Investment into gold does not generate profits during the economically stable times. The investment into the golden metal is often psychological, because this yellow metal is an old symbol of prosperity for the simple people who do not understand that real numbers are often very different from the imagination and visual perception. Thank you for visiting the epSos.de website and thank you for supporting the creative commons movement. You can share this article and all of the free pictures from epSos.de with the valuable people who love you. Thank you !